The challenge this week is The Creative Side Of You! Creative, eh? I always say I’m not very creative…except with cooking, so I guess a picture or two of something I made will have to do! First up is a blueberry shake! I picked the blueberries and added them along with some sugar to vodka to make a lovely blueberry infused alcohol. 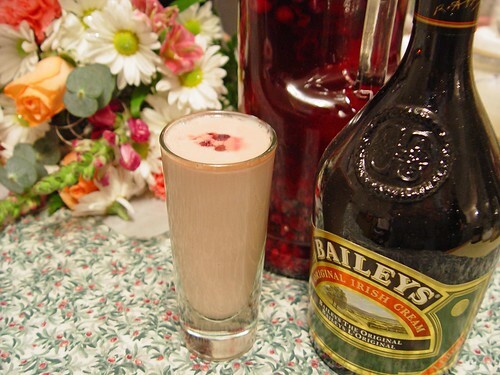 For a special drink, I mixed some of the blueberry vodka with some Bailey’s…yum! 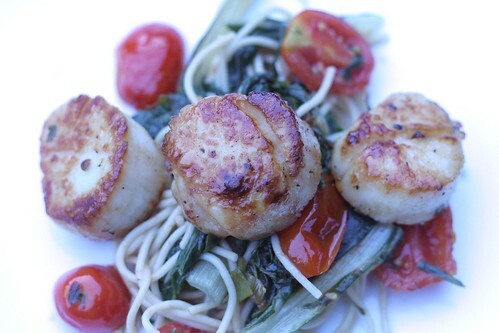 Here are some scallops I panfried, along with some cherry tomatoes I grew in my garden, with some swiss chard & pasta. Delish! Very nice photos! Now I’m hungry! I’ll pass on the vodka, but the scallops look great! Mmmmm, I love blueberries — your drink creation sounds wonderful! I’m not sure I’ve ever had scallops cooked right but yours look like they definitely are and I would love to try them. Very creative!! Oh great, now I am thristy & hungry! They look so good, I can just taste that drink now……. My goodness that sounds too yummy! I was hoping someone would share recipes, jeepers now I am hungry! Now I’m hungry too! Good shots. You’re making me hungry…and thirsty! Great post! Thanks, guys, for all your kind comments!!! Hmmm, looks delicous your cocktail and the scalopps too. Nice creation and probably very tasteful too ! Bailey’s! That drink looks really good. And I need a drink right now, too.